Finally, on the Fourth Sunday of Easter, we move on from the Day of Resurrection—only to transition to the topic of shepherds and sheep! In fact, today is commonly referred to as “Good Shepherd Sunday.” For me, this day brings to mind the many paintings and stained-glass windows that we have all seen of Jesus’ cradling a snow-white lamb in his arms or of his carrying a poor little stray on his shoulders. 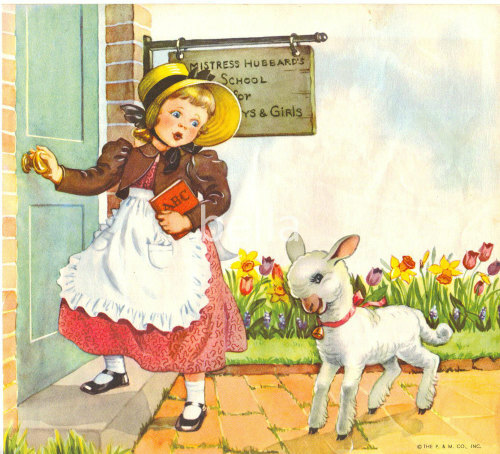 When I was a child, this Gospel story reminded me of the nursery rhyme “Mary had a little lamb. It’s fleece was white as snow.” Not living in the country, these images were all I knew about sheep until I was well into my 20s. Imagine my shock when I first saw real sheep up close and in person. They weren’t as white as snow at all! In fact, they were filthy and smelly beasts. And I am told that they aren’t terribly bright! So, why on earth does Jesus compare his followers to sheep and himself to a shepherd? Well, Jesus doesn’t tell us in so many words, but I have some educated guesses. I suspect that Jesus compares his followers to sheep, not because of our stupidity or our lack of hygiene, but because, like sheep, we have a tendency to stray. Recall Isaiah 53, “All we like sheep have gone astray. We have turned every one to his own way.” Jesus, as our shepherd, is there to gather us back into the fold when we stray. And he will go before us to lead us to the green pastures and still waters mentioned in Psalm 23. Note that I said “he will go before us.” In the Middle East, the shepherd goes ahead of the flock, and the sheep are trained to recognize the shepherd’s voice and to follow his lead. Likewise, Jesus, as our shepherd, is one who has gone ahead of us, and we are expected to follow in his footsteps. 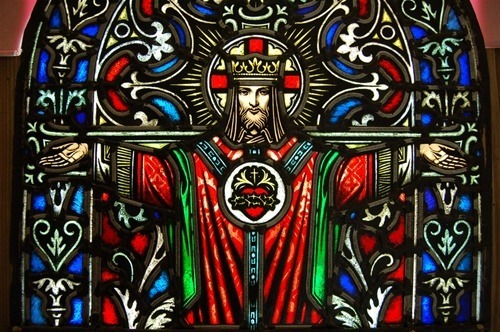 Today is the Last Sunday after Pentecost, sometimes known as Christ the King Sunday. It’s meant to be a festive occasion celebrating Jesus Christ’s sovereign rule over all Creation. But to be honest, today’s Gospel reading lets some of the air out of the party balloon! Last week, we were threatened with the Outer Darkness, “where there will be weeping and gnashing of teeth.” This week, we get the threat of “eternal fire prepared for the devil and his angels.” Not much of an improvement! Now, I maintain that there is, in fact, Good News in this Gospel reading. But it takes some work to find it, mostly because it takes some work to figure out what Jesus is talking about. The reading is deceptively simple. You might be tempted to sum it up as follows: serve the needy and go to Heaven; ignore the needy and go to Hell. And preachers for the last century or so have, in fact, taken that interpretative route. But the meaning of today’s reading is not so clear. There are two issues with the language of the text that greatly affect its meaning, and they have been a bone of contention since the 3rd Century: Issue #1) What does Jesus mean by “all the nations”? and Issue #2) To whom is Jesus referring when he speaks of “the least of these who are members of my family”? 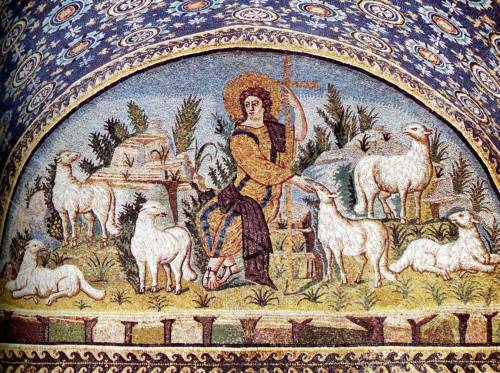 Today is unofficially known as Good Shepherd Sunday, because all but one of the readings make reference to shepherds. That one exception is the first reading from the Acts of the Apostles. So let’s look at that first before we move on to animal husbandry. The first line in today’s reading from Acts provides the Church with a spiritual rule of life. The earliest Christians, we are told, “devoted themselves to the apostles’ teaching and fellowship, to the breaking of bread and the prayers.” Like them, we too are to devote ourselves to the apostles’ teaching. We do this when we meditate on the New Testament. We do this when we listen to a sermon or attend a Bible study. We devote ourselves to the breaking of bread and the prayers when we attend the Eucharist and when we pray our daily devotions. But what about devoting ourselves to fellowship? Don’t we do that at every coffee hour? Yes and no. The Greek word translated here as “fellowship” is koinonia, and it has a wide range of meanings, such as sharing, participation, communion, and even communal ownership. The earliest Christians understood this kind of fellowship as requiring them to “sell their possessions and goods and distribute the proceeds to all, as any had need.” This is so much more than signing up to bring snacks to the Sunday coffee hour! Such fellowship as is commended to us in the Acts of the Apostles requires profound mutual commitment, up to and including financial support for the poor in our midst. A sermon preached by Christopher L. Webber at the Church of the Incarnation, San Francisco, on April 16, 20015. Well, cows may be smart, but not that smart. Sheep are not smart at all. But Jesus used them as an example because sheep are a lot like human beings, they’re a lot like us. There’s a form of confession in the Prayer Book in Morning Prayer Rite One that says it in so many words: “we have erred and strayed from thy ways like lost sheep.” We, like sheep, have a tendency to err and stray from the ways. The cowherd claps his hands and calls Bossy and Bossy comes. The sheep just keep on munching. The shepherd needs a crook to pull the sheep back from danger and the crook has a pointed end to prod the sheep in the right direction and he needs a good sheep dog if possible to run around and bark at the sheep and nip at their heels to get them moving the right way because without all that help the sheep would get lost. Sheep just focus on the next blade of grass and keep on munching as long as they see that next blade of grass until they’re hopelessly lost. Sheep are not smart. So Jesus chose a relatively stupid animal to illustrate God’s love for us. When he compares us to sheep it’s not a compliment! 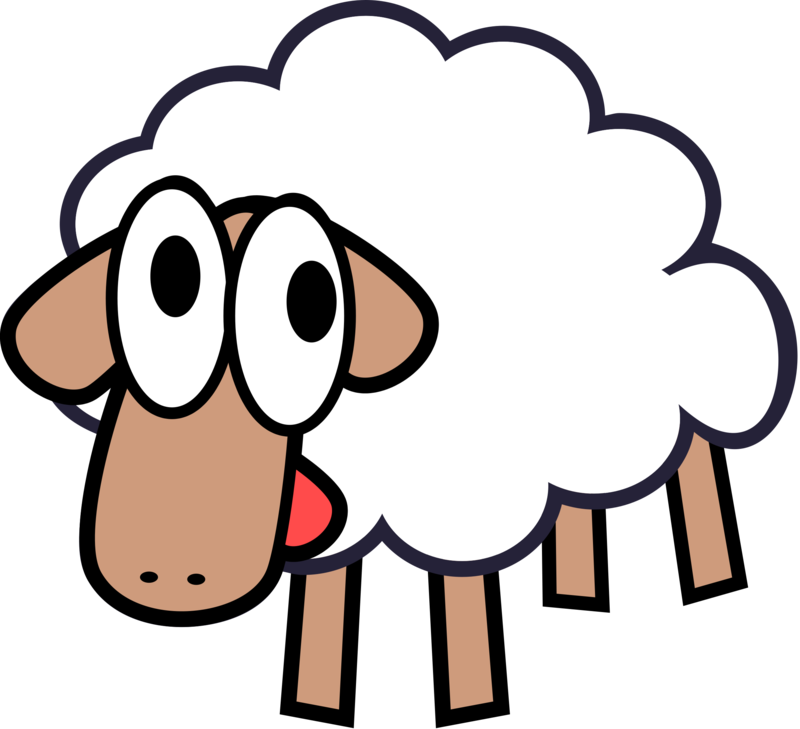 Jesus is saying we are like sheep: wandering, without much inner guidance, with a tendency to get lost, with a tendency to get into trouble. It’s not, as I said, a compliment, but it is probably a fair assessment. Yeah, human beings are like that. I’ve met a few of them. I read about them in the paper. I see them on television. It makes you wonder. And, to be honest, I know myself well enough to recognize that Jesus was right. But I Don’t Want to Be a Sheep! In the first parable, we’re told that the rightful shepherd is let into the sheepfold by the gatekeeper. The shepherd calls each and every one of his sheep by name, showing no partiality at all. His sheep recognize his voice and follow him; whereas, they will not follow the unfamiliar voice of a thief. It’s pretty clear that we’re dealing with an allegory here. Jesus is the shepherd, and the flock in the sheepfold is the Jewish people. Those Jews who belong to Jesus recognize who he is and follow him. The sheep left in the fold are the Jews who do not belong to Jesus and do not respond to his call. Now, the thieves and bandits in the parable probably represent the untrustworthy religious leaders of Jesus’ day. But it’s anybody’s guess who the gatekeeper who lets in the shepherd might be! Some have speculated Moses; others, John the Baptist, and still others, the Holy Spirit.